Date & time: Monday 19 November 2018, 17.00-19.00 hrs. Entrance is free, registration not required. “Babylon” stands for the thought that valuable political life does not depend on deep unity among citizens, or on a strong identification between citizens and the state, or on the state itself as a source of ultimate moral authority. It treats politics as something that happens to us, as other social phenomena happen to us, not as something we will into being or a flattering reflection of our moral selves. Politics, like the rain, falls on the just and the unjust alike. We often rely on an overmoralized, teleological image of the unified political people, and of the Weberian state it inhabits. I argue that the sources of political and legal order are more varied, the sources of democratic stability more pluralistic, and the sources of justice much more complex than we would think from ideal theory, mainstream democratic theory, or dominant public ideologies about questions of loyalty, allegiance, and national identity. This allows us to see that there is a justice of Babylon as well as a peace of Babylon; we need not imagine a strong mutual identification between our wills and the state or among the denizens and subjects of the same state in order to use the critical language of justice and injustice, or to be able reasonably seek and promote justice among strangers. Indeed, that is the only political justice we ever truly have access to. 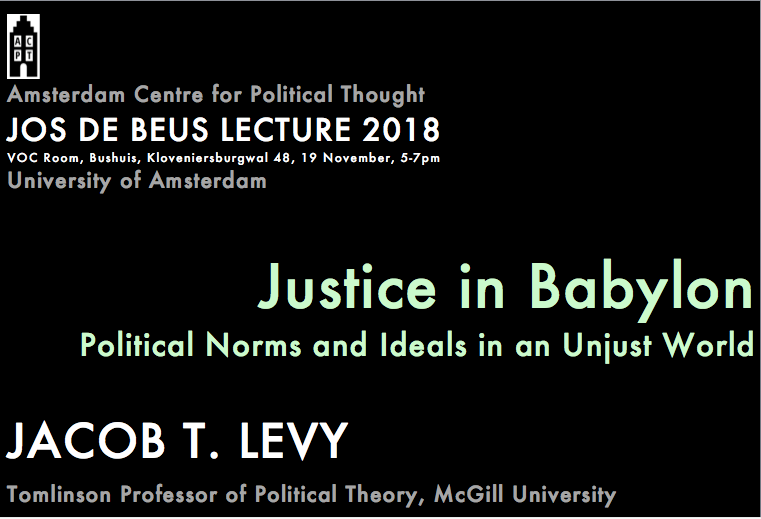 Jacob T. Levy is Tomlinson Professor of Political Theory, Professor of Political Science, and associated faculty in the Department of Philosophy at McGill University. His areas of research include liberal and constitutional theory, federalism and local self-government, multiculturalism and nationalism, freedom of association, and the history of political thought, especially centered on the eighteenth century and Montesquieu. He is the author of The Multiculturalism of Fear (OUP 2000) and Rationalism, Pluralism, and Freedom (OUP 2014), and editor or coeditor of Colonialism and Its Legacies, Nomos LV: Federalism and Subsidiarity, and the forthcoming Oxford Handbook of Classics in Contemporary Political Theory. 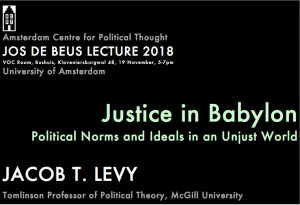 The Jos de Beus Lecture 2018 is made possible by the research group Challenges to Democratic Representation of the Department of Political Science at the University of Amsterdam.